Do you have a high school student that is studying the art of debate? Pick up this book. Do you need to know how to converse with someone, anyone, on any subject at all? Pick up this book. It examines speech and debate tactics which Jesus used magnificently well and talks about why certain approaches in speech work to communicate points while as other methods might not be half as effective as you might otherwise desire. In short, this book is top notch for debate students. I'll be hanging on to this book as a reference for when our kids are old enough to study speech and debate methods. It's excellent. What did I get out of it for myself? Mostly, I honed in on the author's encouragement/instruction to "be real" with the information I'm sharing. Do I sincerely believe the words that are coming out of my mouth? If not, I should probably think twice before saying anything at all. My words, my passions and my beliefs need to be sincere, focused and truthful in all ways and at all times. That is one of the ways in which your communication is effective - when people can tell that you are the real deal. Jesus was the real deal and I, too, should be. It's not an easy thing to carry off all of the time but it's something to work towards not just in real life but here in bloggy land! Real thoughts, real life, real living. (That last tagline was somewhat stolen from someone.) Not a bad motto or goal to strive towards, ya think? 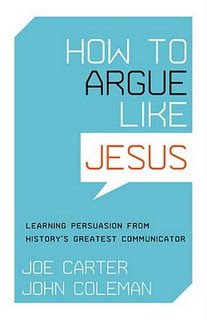 How to Argue like Jesus really is fantastic and it is a great resource, especially for anyone desiring to be an effective communicator. This is a new release from Crossway Books and a worthwhile resource to spend some time with. Grab a copy. Soon. You'll be glad of it. BTW, the story is up. Thanks for your input! This book sounds like a great resource for anyone needing to refine the art of effective communication. I think I am going to look further into this book. Okay, I passed on this one, kind of following Ronnica's line of thinking and now I'm wondering maybe I shouldn't have...sounds intriguing!